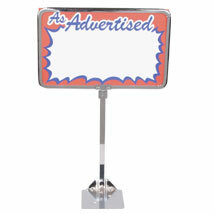 All steel sign holders have an attractive, tarnish resistant chrome finish. This 5 3/4 in. w x 5 in. d shovel base sign holder has a 10 in. high stem. Available for signs 5 1/2 in. W x 7 in. H or 7 in. W x 11 in. H.